In Switzerland too, people are looking forward to wind power! The Antaris 5.5 works here on a 18m high mast and supplies the farm with clean wind. The Antaris 2.5 kW in Spitsbergen! The Antaris wind turbine here supplies the shown station with energy in the hybrid system with PV. A happy new year and all the best for 2019 wishes you BRAUN Windturbinen GmbH! Below the yield overview 2018 of 3 pcs. (2x10 kW, 1x7.5 kW) Antaris wind turbines! 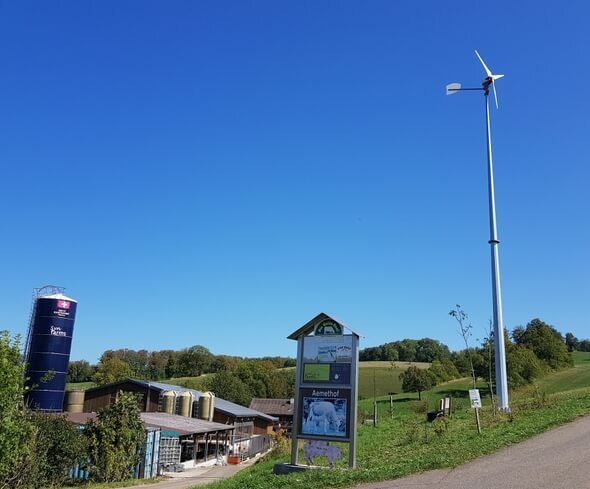 The Antaris 5.5 kW works here on a 20m high mast in Hungary and supplies the farm of a family there.